1 e4 e6; 2 d4 d5; 3 Nc3 Bb4; 4 e5 where Black plays 4 ... b6, intending to follow up with ... Ba6. The trouble with this Winawer line is that White can utilise the time gained to either attack on the king side or build a big advantage in development, e.g. after 5 a3 Bf8; 6 Bb5+ or an immediate 5 Qg4. The bishops are coming off, costing White a key attacking piece, and the nature of the game becomes a clear battle between Black's play down the c-file and White's space advantage. Note: Black played 6 ... cd first to avoid giving White the option to meet ... Bb5 with c4. 8 Bxb5+ Qxb5; 9 Nc3 Bb4! 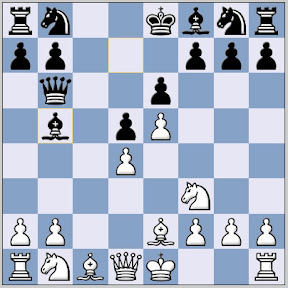 ; 10 Bd2 Qd3; 11 Qa4+ Nc6 with an equal game. 8 0-0 but after 8 ... Bxe2; 9 Qxe2 Nc6; 10 Nc3 Nge7; 11 Rd1 Nf5; 12 Be3 Be7 Black went on to win. I am loving these quicky opening overviews talking about "the weakness" and stuff.